Whenever we’re looking for a bit of peace and quiet, Bhutan is always our go-to destination. Vast mountain valleys and rich culture, it certainly makes for a refreshing change of pace. No more so than now that new kid on the block, Bhutan Spirit Sanctuary, has arrived on the scene. The country’s first wellness-dedicated luxury property, everything about this tranquil retreat has caught our attention. The panoramic views from the 24 relaxing guestrooms. The farm to table cuisine seamlessly fusing east with west. The spa, oh, the spa. Check into Bhutan Spirit Sanctuary and you’ll soon forget what stress even is. There is such an overwhelming sense of peace at Bhutan Spirit Sanctuary that you’ll find it hard to believe that it’s just a twenty-minute drive from Paro International Airport. Lying in the spiritual Neyphu Valley at what is fabled to be the entrance to the earthly paradise of Shangri-La, we couldn’t think of a better place to escape to. 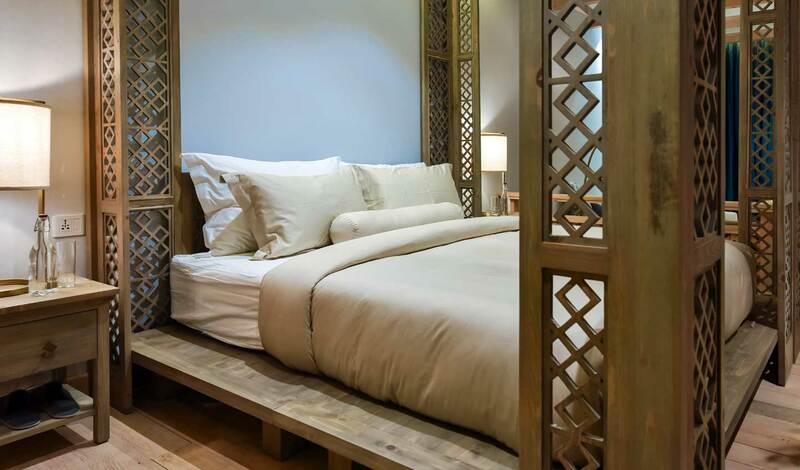 Elegant spaces to relax and unwind, the 24 guestrooms at Bhutan Spirit Sanctuary are luxuriously comfortable whilst still in keeping with the spirit of Bhutan. Opening up to panoramic views over the valley and forests and on towards the historic monastery of Eutok Samdrup Choeling Goenpa, there is a feeling of real serenity. So don’t be surprised when you don’t find a television in your room. Instead, disconnect out in the garden, sitting beneath an apple tree and losing yourself in your surroundings. Anywhere where our spa treatments are specifically tailored to us has us sold. On arrival at Bhutan Spirit Sanctuary, you’ll meet with one of their in-house well-being guides who will read your pulse to determine what ails you, before creating your customised well-being journey. Encompassing everything from massages and monk-led meditation to hot stone baths in men chu healing waters and Hot Herbal Compressions, this truly is a sanctuary for body, mind and spirit.